All this Tom DeLonge/To The Stars Institute stuff flying around the internet these days has got me thinking (reluctantly) about "Capital D" Disclosure. I get it that a lot of people are desperate for someone to reveal "the truth" about UFOs, and I get it that a lot of people have an unshakeable belief that the government knows this "truth" and is going to reveal it to us all when the time is right. Uncertainty is unbearable for these people -- they need to believe something can be proven about ETs & UFOs -- excuse me: Advanced Aerial Threats (AATs) -- and it seems there's always someone ready to prey on their uncertainty. That and recent comments here at High Strangeness have forced me to re-examine my beliefs about Disclosure. Don't worry, I still think it's a load of crap. If Disclosure were ever to take place (which it won't), it wouldn't be the government's call. It would be entirely up the the aliens -- assuming they exist -- to reveal their presence to the world, and since they haven't done it yet there's no reason to think they will anytime soon. If they exist. "What if I could decide how and when Disclosure was to take place?" It's kind of a fun idea, I have to admit. In this scenario, I alone have first-hand knowledge that aliens have been visiting the earth and have been influencing human events, and the time has come for me to spill the beans to the estimated 7.6 billion people of earth. How would I do it? Where would I do it? When would I do it? We're all suckers for give-aways, so why not incorporate that into the Disclosure plans? I'd launch a year-long, world-wide, enter as often as you want online sweepstakes, and the Grand Prize winner would get to spend three days and two nights as guests of our new alien friends in a luxury suite aboard their UFO. 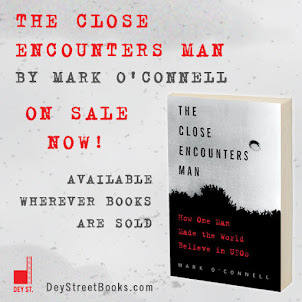 The package would include sightseeing trips to the moon and our neighboring planets, an autographed copy of my book, The Close Encounters Man, and $500 cash. I'm pretty sure the aliens would go along with it. Sure, it robs them of the long-anticipated landing on the White House lawn, but I think the fact that it would raise their cultural stature from "Visitor From Another Planet" to "Valuable Prize" would more than make up for it. And the winner could pretend to be Richard Dreyfus at the end of Close Encounters of the Third Kind, which would be kind of cool. And I'm sure I could persuade the aliens to kick in a few items of advanced technology that they have lying around as awards for a few thousand runner-ups: ray guns! anti-grav devices! free energy!! Hell, I'd even persuade the aliens to personally present a real free energy device to Tom DeLonge. As a huge added bonus, by making a big game of it, I ensure that none of that "societal breakdown" business that Disclosure fans worry so much about will come to pass. I don't know, I just think we need put the fun back in Disclosure, and this is the way to do it. How about you, dear readers? If YOU were in charge of Disclosure, how would you announce the alien presence to the people of earth? Tom DeLonge is a younger Bill Moore, a pawn of those who know how to manipulate him. Grant Cameron has him pegged. Grant's book Managing Magic: The Government's UFO Disclosure Plan is very good. You are correct that the only time disclosure will happen is when the aliens want it. What I especially dislike about To The Stars Academy is that it strikes me as a money making scheme. Buying shares of common stock to further Tom's agenda. Nope, not for me. Yes, and a $200 minimum investment, no less. You shouldn't have to pay to be shown "the truth." Why with a reality TV show, of course. Something like “Keeping up with the Alpha Centaurians” or “Dancing with the Aliens” or “Reptilian Tank”. After all, nobody questions reality TV because it’s all 100% true. Right? You are right. Any extraterrestrials could reveal themselves if they wanted to. After at least the past seventy years they haven't had the desire. Can you blame them? 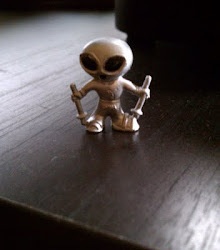 De Longe is the most recent flim-flam man in the Ufology field. As long as there are humans who are hoping for the space brothers to bail us out, De Longe should have no trouble making a buck or two off the gullible. I love the reality show idea! "The Real Aliens of Atlanta"
Nah, reality shows?...there's so much crappy "reality" shows on the medias now that it would probably just amalgate with the rest. You make it big: freeze the oceans, teleport the Statue of Liberty on the the lawn of that house with a 12 km backyard in Ryongsong district, melt Antarctica to reveal a mégapole from the future, turn water into wine....All that with a big motherfu*g ship! People have to stop doing whatever, stand still and breathe in the implication. "People have to stop doing whatever, stand still and breathe in the implication." 1. Do you plan on partnering with the UFODATA project or some similar public research entity? 2. Do you have in your possession or plan to make public, documents that back up Luis Elizondo's claim that UFOs are a real; they exist, and they have been officially documented? 3. I did not see any underlying mission to support UFO/UAP scientific research. Am I missing something here? "Sorry, we don't have to answer these specific questions at this time. This form is for basic questions about the investment phase and basic overview of the Academy. Hopefully, you will find the answers to your questions answered on our website in time. You can find all available information on the Academy on our website and the videos available on our site. Be sure to follow along on our site as we post updates and news in the future." It beats me how he got those advisors and consultants to go along with this strategy. Even Leslie Kean, a fairly respected journalist and author in the field of Ufology has helped by posting articles that provide somewhat of a positive view of this endeavor. However not sure if anything will come out of this that moves Ufology research forward. "Sorry, we don't have to answer these specific questions at this time"
Whaaaaa....??? They don't need to be accountable to anyone, I guess. Big surprise! If disclosure meant instability and possible wars, economic chaos and general breakdown of society,(it just might) then it would be prudent to de-sensitize us over decades. I agree with previous post about Cameron's book and ideas concerning disclosure. If I told you that there are beings who could come into your house at will and do what they want and our government has no control over that....well you can imagine the implications. I think we'd all be very surprised to learn just how many of us already assume that beings can enter our homes at any time, and the Gov't can't do anything about it!